Expand your social media “trends” knowledge. With 100+ speakers covering a wide variety of topics in the field, you can expect to leave our conference with an in-depth understanding of the major industry trends, elevating your own expert skill set. Our conference features top industry leaders like “Insta”-famous @girlwithnojob, Bruce Croxon; founder of the first online dating community and body-positive blogger/influencer; Kenzie Brenna to name a few. Take your expertise and productivity to the next level with tips and tricks from our social media pros! With 2 days of interactive workshops, panel discussions, fireside chats and more, our speakers will share with you tactical best practices and tips that you can apply to your own job immediately. Don’t miss our Social Video Trends & Best Practices in 2017 and Beyond talk as well as Social Media vs. Reality: Staying Grounded in the Digital Space panel discussion. Grow your network. 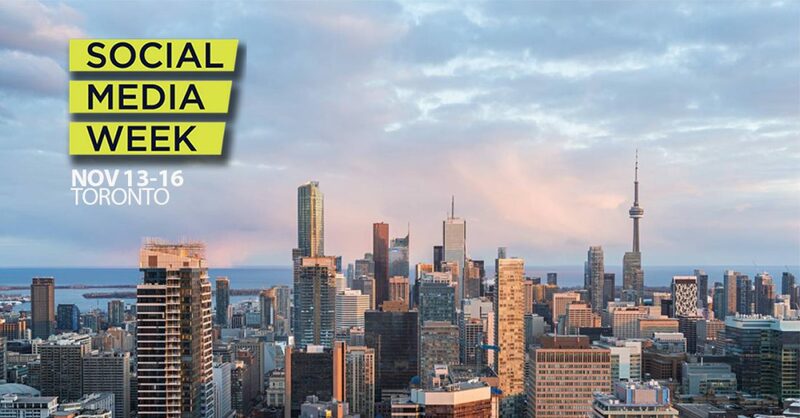 Our 350+ attendees ARE Toronto’s most socially active. Whether you are looking for business development opportunities or a new job, take advantage of our networking breaks and connect with other attendees. Check out our talented, diverse board of advisors and be sure to reach-out to connect at the conference. Don’t forget to bring your business cards! Make King Street West your remote office for the week.Once a hub for manufacturing, the King & Spadina area is now home to Toronto’s leading tech companies, delicious restaurants, awesome entertainment, street art and so much more. Take some time to explore the area and find those hidden gems! Additionally, all of our major venues (CBC’s Glenn Gould Studio, BrainStation and BrightLane) will provide wifi and co-working spaces, so you can hop on that last minute client call without having to scramble, and return back to our programming when it suits you. Check out Toronto’s trendiest office spaces. We’re proud to offer tours in some of Toronto’s most coveted offices. Take a look at TIFF Bell Lightbox’ camera & projection booth, or let your creativity flow at Toronto’s Youtube Space. Admire Toronto’s beautiful skyline. Don’t miss our opening party at Entertainment One – which offers an exquisite 360 degree view of downtown toronto! Build industry allies. Our evening events offer an opportunity for like-minded attendees to connect and get to know each other. It’s great to have an ally in the field who you can bounce ideas off of or mentor! Get a fresh perspective beyond your office. Take a step back and look at your processes. Be open to learning new ways to improve how you and your team do your jobs. Press the reset button. There is nothing like spending a week in a different environment amongst creative people with the same passion(s) that you do, to get your creative juices flowing. Have Fun! Trust us, learning can be fun! Lots of our speakers are sure to make you laugh. Explore the world of VR at our closing party hosted by House of VR.